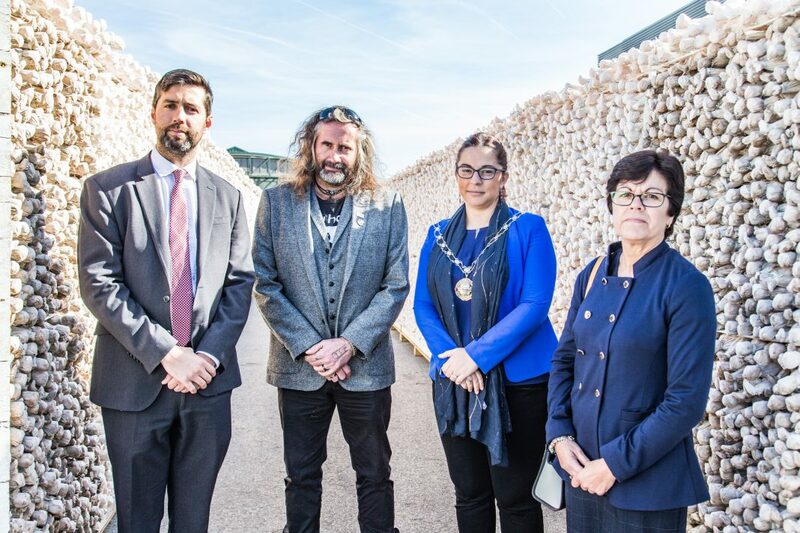 The Trench, an evocative part of the Shrouds of the Somme artwork installation by artist Rob Heard, was officially opened at Aerospace Bristol on the historic Filton Airfield in South Gloucestershire on 29 September. The exhibition, commemorating 72,396 men killed in the Battle of the Somme, whose bodies were never recovered, was officially opened by Dame Janet Trotter, Lord-Lieutenant of Gloucestershire and Cllr Rachael Hunt, Chair of South Gloucestershire Council, together with Commodore Jake Moores, Chair of Shrouds of the Somme. Members of the public joined specially invited guests at the moving and respectful ceremony featuring veteran standard bearers, a bugler and cadets from Bristol Adventure Sea Cadets, Royal Marine Cadets and RAF Air Cadets from 2152 and 2152 DF squadron. The 2m high, 45m long, wooden trench, stacked with tens of thousands of shrouded figurines representing men killed in the Battle of the Somme, is on show at the Aerospace Bristol museum thanks to funding from South Gloucestershire Council with support from SSAFA Bristol & South Gloucestershire, Airbus, YTL, DHL and the Commonwealth War Graves Commission. The names and details of all 72,396 Commonwealth servicemen killed at the Somme who have no known grave are displayed on the outer walls of The Trench, sourced from Commonwealth War Graves records and will be read out by volunteers all day, every day of the two weeks that the exhibition is on display in South Gloucestershire, although it is not expected that they will complete the list. The immersive installation generates powerful emotions as people walk through it, giving a graphic sense of both what it’s like to be in a trench and what the vast numbers of those killed really mean. Cllr Rachael Hunt, Chair of South Gloucestershire Council said: “We are proud to welcome this exhibition to South Gloucestershire which gives local people a most moving and powerful experience and a chance to remember all those who have given their lives in the name of their country. The free exhibition will be open to the public at Aerospace Bristol every day from 10.00am to 5.00pm until 14 October 2018 after which the Shrouds of the Somme travel to London to be laid out at Queen Elizabeth Olympic Park in November for the Armistice Centenary.